More Fun With Needlepoint – Day 1 – The Embroiderers' Guild, Queensland Inc. This is a two-day class to be held on Saturday 4 May (Day 1) and Saturday 11 May (Day 2). In this class participants will embark on a journey through twisted stitches and padded embroidery utilising needlepoint stitches. The geometric designed panel is worked on 32ct Lugano fabric and can be utilized in a variety of projects such as a bag. 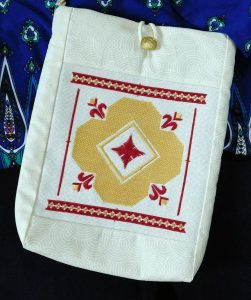 The class is designed for those with a sound knowledge of basic embroidery and a strong appreciation of counted thread embroidery will be an advantage. Some preparation is required prior to the first day. Kit will cost $15 and includes fabric, teaching notes and instructions. Bookings are essential, with a cut-off date of 20 April. Please complete the Class Registration Form on the website. For further information, contact the Class Registrar by emailing classes@embroiderersguildqld.org.au or phone 3252 8629.